Washington Grove is governed by a Council of citizens consisting of 6 elected Councilors and a Mayor. Elections are held yearly in May, with two councilor positions rotating for election each year. Town residents are encouraged to attend Council Meetings and participate in “Public Appearances” in which issues are aired and discussed by Town residents urging some action by the Council. There is a Town Meeting yearly in which Town Residents examine and approve (or ask for changes to) the coming fiscal year’s budget. When issues of significant importance are pending, a Special Town Meeting is often called to allow for an exchange of ideas. Council meetings are held at 7:30 p.m. on the second Monday of every month in the Council chambers of the Town Hall. 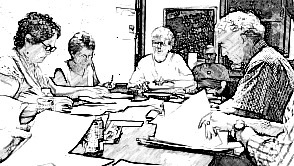 Each Councilor is liaison to (typically) two Town Committees, with responsibilities to attend meetings of those committees and report back on their activities. Individual Councilors are also responsible for administration of contracts for road maintenance, trash and recycling pickup, tree maintenance, and other ongoing upkeep efforts. Most of the work in keeping the Town running, however, is performed by volunteers in the many committees including the Woods Committee, the Recreation Committee, the Lake Committee, the Historic Preservation Commission, and many others. Volunteerism is high, allowing an extraordinarily broad range of activities and events. The Town Clerk, Kathy Lehman, is usually available in the Town Office between 9:30 a.m. and 4:30 p.m. Monday, Tuesday, Thursday, and Friday and from 1:00 to 4:30 p.m. on Wednesdays and is available by phone at 301-926-2256, during those hours. After hours, you can leave a message at that number or an e-mail at [email protected]. Minimum standards for lot sizes, etc.